Less than a year after its national launch, Walmart is pulling the plug on its $50/year ShippingPass subscription service that was intended to compete directly with Amazon Prime. In its place, the big box retailer plans to offer free-two day shipping on millions of products with a lower minimum purchase price. This morning, Walmart announced the end of its ShippingPass service, while also launching a new no-membership shipping option that lowers the minimum purchase amount for free shipping from $50 to $35. The new shipping option will be available on two million items that customers purchase the most, the company says, noting that this includes household essentials, pet products, food, cleaning supplies, beauty products, and toys. 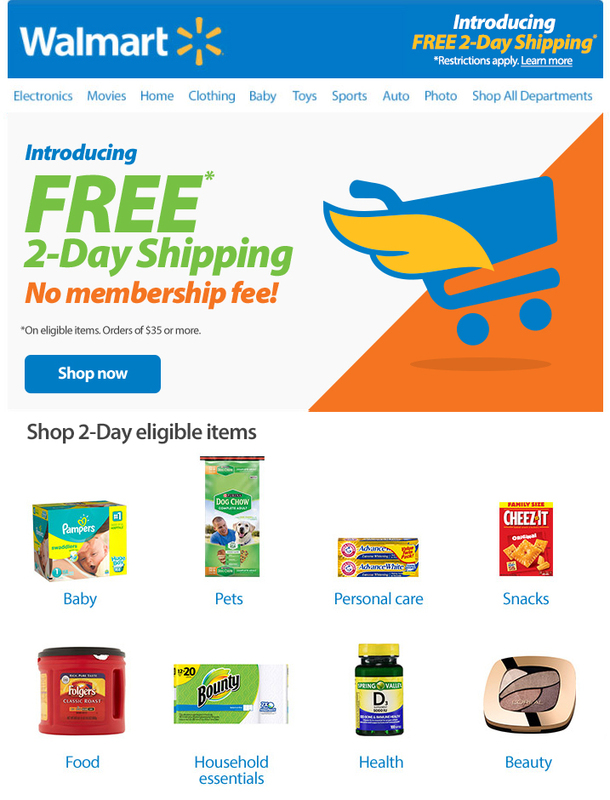 If Walmart.com shoppers are willing to go to a Walmart store to pick up their online purchases, there will be no minimum amount required for free shipping. “Two-day free shipping is the first of many moves we will be making to enhance the customer experience and accelerate growth,” Marc Lore, president and CEO of Walmart eCommerce said in a statement. The revamped shipping option, Walmart says, means there is no need for ShippingPass, the $50/year Amazon Prime competitor the company launched nationally in the summer of 2016. Walmart first began testing ShippingPass in 2015, offering customers who paid the $50/year subscription price the ability to receive their orders in three days. When the company officially launched the service in June 2016, it cut down its shipping window to two days to match its competitor, Amazon. Since then, Walmart acquired Amazon rival Jet.com for $3 billion. While ShippingPass only cost half the price of Amazon’s $99/year (or $10/month) Prime service, it didn’t offer the extras like streaming video, music, free photo storage, and other ancillary options.